The weather for tonight’s star parties is indicating 100% Cloud Cover. Our telescopes do not see through the clouds. It would be typical for the Wagman Star Party to cancel under these circumstances. The Mingo Planetarium can run indoor programming and is more likely not to be cancelled. Please check back for updates. This should be updated again by 4 PM. 2PM Update. As of 4PM, there are no updates since the last one stating 100% cloud cover anticipated. On Sunday night the 27th enjoy the total eclipse of this year’s Super Moon also known as a Blood Moon at AAAP’s Observatories. The event is free (donations greatly appreciated) and open to the public. The Mingo Planetarium presentations will occur regardless of weather, however, outdoor eclipse observation at Mingo Observatory and Wagman Observatory is subject to cancellation due to inclement weather. The members of the Amateur Astronomers Association of Pittsburgh invite the public to Mingo Observatory and Wagman Observatory, Saturday, September 19, 2015. Enjoy the clear skies of late summer. It is our partner the Astronomical League‘s Fall Astronomy Day and International Observe the Moon Night. Help the Amateur Astronomers Association of Pittsburgh by making a donation through the Washington County Community Foundation’s Washington Gives Day on September 9, 2015. Donations made on that day online or by check before that day will be matched from a 100,000 donor pool. All donations will be used to further enhance our educational programs and outreach. WCCF Gives is a one-day event, in which each donation you make to your favorite Washington County charities via www.wccfgives.org or by check will be increased by a percentage of a bonus pool estimated to be at least $100,000. The Washington County Community Foundation (WCCF) is a tax-exempt, 501(c)(3) not-for-profit corporation. It was initiated by community leaders to encourage charitable giving. Its mission is to improve the quality of life primarily in Washington County by providing a vehicle for philanthropic giving across a broad spectrum of giving levels to support diverse community needs and to provide prudent stewardship of those charitable funds. 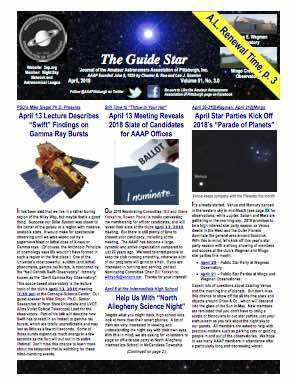 Help the Amateur Astronomers Association of Pittsburgh Raise More. which will be “active” on September 9, 2015.
or by Check before September 9. Give a gift starting at $25.00 that’s worth more by supporting AAAP through WCCF Gives. All WCCF Gives donations made to participating 501(c)(3) charities via www.wccfgives.org or by check will be increased by a percentage of a $100,000 bonus pool! WCCF Gives check contributions must be received at the Foundation office by 8 p.m. on Gives day. Checks may be hand-delivered or mailed in advance of the event. Checks must be made payable to “WCCF.” Check-writing donors can support multiple charities by submitting one check for the total amount along with an official WCCF Gives Check Contribution Form, available online and at the WCCF office (1253 Route 519, P.O. Box 308, Eighty Four, PA 15330).